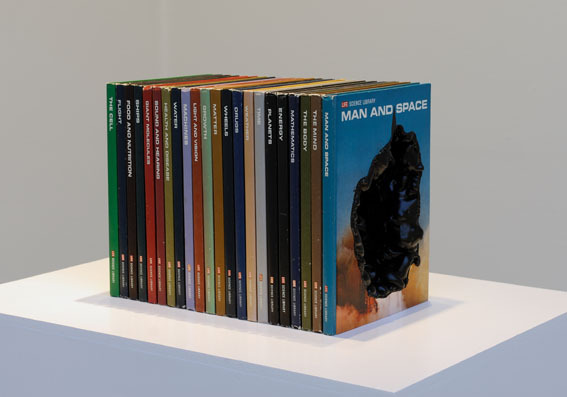 Books, polyurethan, spray paint, rubber cement, 46 x 30 x 22 cm. 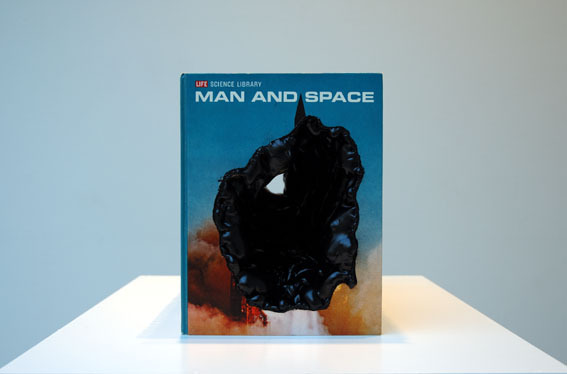 In this sculpture the book as a container of knowledge and information has been transformed into a useless object. A negative, formless void has penetrated the logical structure of language. The series of books from The Life Science Library has been saved from the garbage heap of history (my father wanted to throw them away). What interested me about them was their anachronism, and that they spoke of my nostalgia for the optimistic world view of the 1950´s and 60´s. I remember sitting on the living room floor in my adolescence, leafing through the books in awe and wonder at the beautiful images of incomprehensible technological phenomena. When I look at the books today - transformed, or even reduced, to a sculpture - they strike me as relics of modernism and the ambivalence of science. I also think about the function of art as sabotage, and the limits of language and rationality as systems to describe the world. This useless object seems to want to transcend its own uselessness, and remind me that knowledge and truth - both in science and art - is in a constant flux, forever to be rediscovered.